Work: Musician, artist and archivist but my full time day job is Lecturer in Music, Goldsmiths University of London. Hobbies: In addition to my work in music, sound and DIY arts practices, I am an avid knitter of mittens and watcher of horror movies. I collect SFX compilations and film soundtracks on vinyl. I raise herds of cacti. How did you find the BoomCase? I was researching building my own portable speaker systems and housing them in unusual ‘objects’ and stumbled across discussion of something called a ‘boomcase’ on a DIY tech forum. I googled the term, found http://theboomcase.com and FELL IN LOVE! What interested you in the BoomCase? The beautiful work by Mr Simo and the BoomCase team appealed to me as it brings together my interests in vintage and domestic ephemera, with my work in music and sound. So many sound systems are very ugly, grey or black plastic – the BoomCase design and ‘up-cycle’ sensibilities means their sound systems can become an aesthetically coherent part of my work. What do you do with your BoomCase? Much of the work I make is a) with music and sound and b) with found and everyday objects. 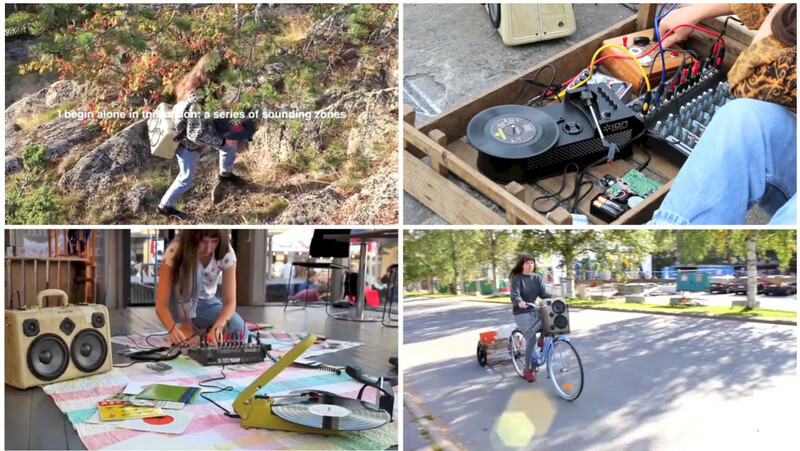 I create installations, I hack objects and playback media, I build small scale DIY electronic music projects, I DJ and play in bands using vintage playback equipment – and much of this I do outdoors or in unusual sites or venues. I mostly use the BoomCase when I want to perform or DJ in a place that has no electricity, or no existing means of audio playback. Has the BoomCase helped you in anyway? Yes, Mr Simo and the team are incredibly inspiring and supportive. In the future I’d like to try to extend my electronics knowledge enough to build my own portable sound system. Nothing will ever be quite like the BoomCase … but that’s part of the joy of custom and handmade items, each one is unique and each maker brings their own ideas and personal touches to the project.